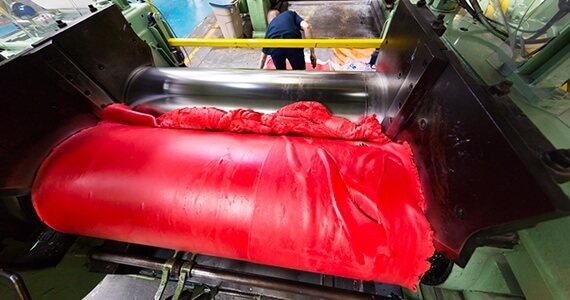 CR or Chloroprene Rubber, commonly known as Neoprene®, was the best option to manufacture products that are to be in contact with oils and fuels in the past. Nowadays, Neoprene® is considered to have a moderate resistance to these components. However, Chloroprene Rubber can be considered a mix solution as it has better resistance to a diverse source of degrading agents (like oil, ozone, chemicals and heat) than Natural Rubber. Instead Neoprene® presents lower physical properties. In spite of the physical properties, Neoprene® has a perfect airtightness, therefore it is widely used in the manufacture of inflatable structures of all sort. Its resistance to fire is also excellent, and can be presented in self-extinguishing formulations if required.